This 144-foot, 55-ton fiberglass pyramid was built by new age healing tycoon Aleksandr Golod outside Moskow. Over 20 of Golod's pyramids dot the countryside of former Soviet republics, where the faithful make pilgrimages to soak in pyramidal power. - The amount of radioactivity becomes less after exposure in the pyramid. Here's a 2008 report from Russia Today. Note that the attractive surgeon is totally dubious. I will accept her word over the wizened snake oil salesman who's yammering about magical prisoner-calming pyramid salts. 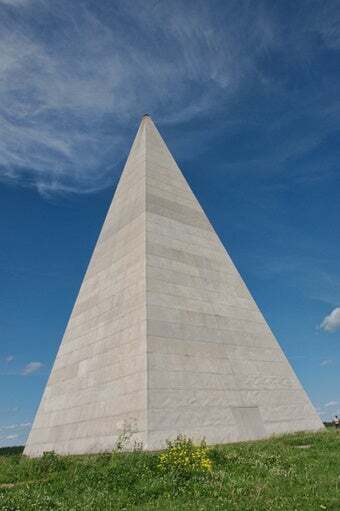 It depends on you whether you believe the magical properties of the pyramids or not, but I did feel strange upon entering this odd construction. Or was it because I got too impressed by the price of the charged water?